2008 was a difficult year, producing results not seen in recent history. In past bear markets, some sectors and significant groups of investors still made money. In 2008 only 4 of 3,438 equity mutual funds showed a profit. The attached chart below (click on image for full size) with 183 years of market history puts a lot of things into perspective. It shows how many years the market returns were in each percentage range. By the time the year had ended 2008 found its place at the second column from the left at -37%. What can we see from history? 2008 was an extremely unusual year. It was not a typical bear market. The only years with losses that high were in the 1930s – The Great Depression. However, the problems we have today are minor compared to the 1930s, when unemployment was over 30% and the total production of the economy fell by 30%. It appears that governments have learned from their previous mistakes and are focused on bailouts and not making matters worse by cutting spending and raising taxes like they did in the 1930s. Years with large losses tend to be followed by years with large gains, usually within 1-2 years. Note that only two years after 1931, great gains were made in 1933 (50-60% column), 1937 was followed by 1938 (30-40%), and most of the years with losses of 20-30% also had good gains within a couple of years. Large gains are much more common than large losses. There are 25 years with gains over 30%, but only 3 with losses over 30%. The markets do make money over time, including these bear markets. Note that 70% of all years are gains, large gains are much more common than large losses, and the most common returns are gains of 0-10% followed by 10-20%. Don’t panic. Stick with your long term goals. The markets have always recovered and gone to new highs. This is the most important time to stick to your plan. If you don’t have a financial plan, this is the best time to start one. Disregard what is in the news. The recovery will not take 10 years. This is not the end of the world. While very unusual. It is not “different this time”. The panic is subsiding and companies will adjust their operations to become profitable again. Don’t turn paper losses in actual losses. If you sell now or invest more conservatively, you will likely miss out on much of the inevitable recovery. If you want to invest more conservatively, wait until after a good recovery. Studies consistently show that trying to get out and time getting back in rarely works. Buy low. Sell high. As Warren Buffett says “Be fearful when people are greedy and greedy when people are fearful.” Remain optimistic and focus on the inevitable recovery. I realize that it is difficult to be optimistic with all that is happening, but our fund managers are telling us they have never seen the market so cheap (even one who is 83 years old!). If you can ignore your emotions, and take advantage of it, this period will probably be the best buying opportunity of your life. Ed Rempel is a Certified Financial Planner (CFP) and Certified Management Accountant (CMA) who built his practice by providing his clients solid, comprehensive financial plans and personal coaching. If you would like to contact Ed, you can leave a comment in this post, or visit his website EdRempel.com. I’ve been following your blog for about a year now and feel as though I’ve learned a lot. I have not yet put any money into the stock market as I’ve been putting everything I have into paying off my mortgage (5.5% closed). I have it down to about 100,000$ left. I’m thinking this year I should probably look at putting my extra (about 15,000$) into the stock market, but I’m a littler nervous as I’m unsure where to start. Any pointers or ideas that might help me out? I dig the chart—I love new visual ways of looking at the stuff that everyone seems to be talking about. 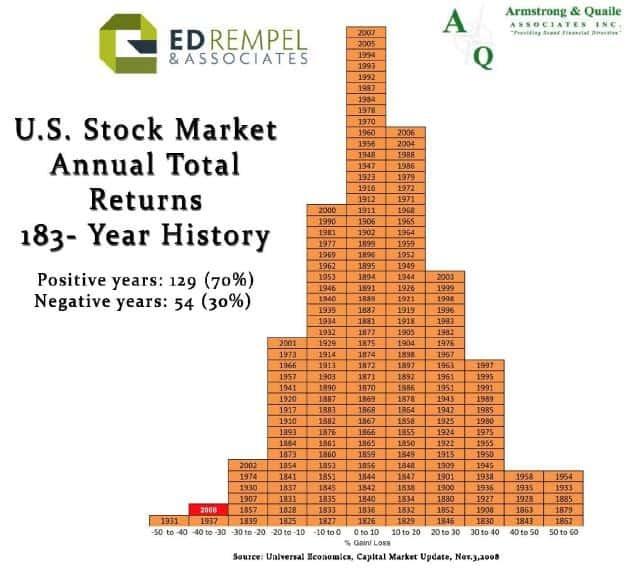 I like the chart – it shows how the distribution of annual stock market returns goes. We could still however experience double digit drops in the indexes this year, which won’t affect the distribution of annual returns that much. You might wish to read Canadian Captialist’s commentary for today. The market is still in uncertain territory, as stated by Dividend Growth Investor above, and $15,000 against your mortgage is about an 8% guaranteed return. Yeah, the chart is a neat look at just how bad 2008 was. I do agree that a rebound will come, just like in 1932 and 1938. I’m looking to move into a bigger house and until that happens I can’t really get back into stocks… hopefully I’ll get my place sold, and move into a new house so I can start a Smith Manoeuvre and take advantage of these stock prices in time! or 2008 = 1931 going to… 33. I wonder where we are. “The recovery will not take 10 years” Why won’t it take 10 years? or 5 years? The only coming bubble I see is Gold and Silver. David, Amanda said her mortgage is 5.5% closed, so how is it 8% return? DAvid is correct. The mortgage return is after tax. If you received a 8% return in a taxable account, after tax would be approximately 5% return after taxes assuming 40% marginal tax rate. I found this post extremely interesting. I have been noticing for the last couple of weeks markets seem to be steadily rising (exception is today) despite the poor news regarding unemployment and layoffs. To me this makes absolutely no sense and it is discouraging because I have recently converted to a Matrix mortgage with the intent of doing some Smith-manouevring/cash damming through rental properties/interest capitalization. I read an interesting article relating to my fears today on globefund.com. Sound advice? Consider the crash of 1929, which Mr. Hoye does often. He draws his market forecasts from history, which he believes repeats itself more or less over long cycles covering many years. After the fall of 1929, the stock market rallied the following year, regaining 50 per cent, only to fall off a cliff later, he notes. The Dow Jones industrial average peaked at 381 in 1929 then tumbled to a low of 195 in November of that year. By April, 1930, it had climbed back to 294. It sank to a low of 42 in 1932. “People who bought at the high in 1929 waited until 1955 to break even,” he says. Mr. Hoye thinks the market is tracing a similar pattern this cycle, heading for a fall of 80 per cent or so, peak to trough. I believe this is an interesting thought considering the markets continue to go up despite any sound reason other than investors attempting to time the market. I would love to read others perspectives on this. My perspective on things is that investors should seriously reconsider the advice from mainstream financial advisers. In fact, question everything they write and speak about. They were wrong. Why listen to them now? Unless they’ve reborn into new thinking – they’ll deliver you the same old results. I like to consider all opinions on the merits of their track record, history, and the facts. Adviser maxims such as “Real estate always goes up” isn’t going to cut it anymore in our new environment. I tend to agree to disregard what the majority of mainstream financial advisers preach. Most are paid on commission and trailer fees and unfortunately do not have your best interests at heart unless it creates more profit for them (this is an over generalized stereotype but from my experience far too true). However, the reason behind my post and quotes from the link is Hoye does not see a recovery from this crisis rather a repeat of the stock market from the Great Depression circa 1929-1932. I am tending to heed his advice because he has been correct thus far without the benefit of hindsight – like the rest of us. %loss is not the same as %gain. Does this graph show that? i.e. a 50% loss is the same as a 100% gain. @Jesse – I doubt it. I think the chart only shows absolute gain from year to year. I find the chart self serving for the folks who put it together. 1) At some point you have to acknowledge that about 100 years of that information is completely irrelevant (you pick the number). 2) Adjusted for inflation in the last 30 years, the market is basically flat. Now take into account taxes paid. 3) The only people who make money in the market are those that sell products and the goverments who tax the gains. Wonder why there are so many products available? 4) Today’s hot idea is tomorrow’s dog. 5) Paying off debt always worked no matter what year it was. We would ignore Mr. Hoye’s prediction in the article, because he is wrong about market history and because we don’t really believe in charting. He is wrong about the market taking until 1955 to break even after 1929. That stat ignore dividends which were 5-7%/year at that time. The breakeven from 1929 including dividends was 1942. If his advice is based on a knowledge of history, why is he wrong about history? We would also doubt any use of a chart from 1930 and comparing it to now. That was a completely different time with comletely different market influences. The markets are only predictable long term. Charts over short term are rarely predictive of anything and mostly show random movements and news events. The stock market does have significantly higher returns than mortgage interest (even after tax), and returns tend to be higher if you start after market declines. I would caution you on trying to time markets by choosing to invest this year just because the market is low. What will you do after the market recovers? The markets are always unpredictable short term, so you should only invest if it is for the long term. The best advice is to plan out what you want in your life long term and develop a long term strategy based on that. Then stick with that strategy through the ups and downs of the market. Since you are not knowledgeable about investing, if you want to invest, you should either stick with broad-based mutual funds or ETFs and buy and hold, or get professional advice from a trusted advisor. Paying down the mortgage might be equivalent to an 8% guaranteed return, but certainly not to an 8% stock market return. Why use a guaranteed return tax rate to make an opinion about a stock market investment? Since capital gains are tax-preferred, even if you sold your entire investment after year 1, you would only need to make 6.9% to clear 5.5% after tax. If you hold a 100% tax-efficient investment for 20+ years and pay zero tax until you sell, then you are ahead with even lower returns. The stock market long term returns are much higher than this, especially if you start after significant declines and hold long term. Amanda could also consider refinancing her 5.5% mortgage. You can get mortgages at 4% today, so if there is time left on the mortgage, it might be worthwhile to pay the penalty to refinance. Good point. A % loss does not equal a % gain. You would need a 33% gain to make up for a 25% loss. This does not change the fact that large gains are much more common than large losses. If you look at the larger losses of 20% or more and compare them to the large gains of 30% or more that you would need to make up these declines, there are still 25 gains to 9 losses. The reason charts such as this are meaningful is that the markets are predictable long term. Short term, they move based on news, sentiment and random factors, but long term they move based on the underlying growth in profits of companies. Most large companies can usually adjust their operations, costs and prices to start making money again after almost any market conditions. In short, long term comparisons are very valid. In fact, based on Jeremy Seigel in “Stocks for the Long Run”, the markets have been astoundingly consistent since 1800 in producing about 7% returns above inflation. He compares several 70-year blocks of time and the real returns are range between 7.0 and 7.2% above inflation. There is a similar result in the last 30 years. From 1978 to 2008, inflation has averaged 3.9% in Canada, while the TSX is up 10.5% and the S&P500 up 10.4%. Even after tax at 40% on the capital gain, the stock market return for the last 30 years is 8.4%. But Ed, her stock market ‘principal’ is not certain to be there. If Amanda had invested her $15,000 in August or September, she would be a long time returning to a $15,000 value at 8.4% average per annum! If she had paid the mortgage, she’d literally have money in the bank! Many folk feel the turmoil in the market is not yet over, so If Amanda invests in her mortgage this year, and waits until next to invest in the market, she likely won’t be that far behind this year’s investors. In the meantime she can work on building confidence and knowledge in entering the markets and start searching for a trusted financial advisor. With my retirement day 30 years down the road i have seen the crash of 2008 as a buying opportunity, I know we can’t predict our future on the results of the past but America will come out of this recession in a stronger position with stronger companies (survival of the fittest). OK, now what did you pay your adviser, broker or mutual fund company? For all that risk, you’re left with what? Just because they’re talking about it and selling it, it doesn’t make it good for the average Joe. Same for those flogging Smith Man. products. Sad really. 1) The biggee is excessive personal, corporate and government debt. Too much economic activity has been borrowed from the future. If it’s paid off or written off slowly over time, it will act as a slow drag on the economy. If it’s written off too quickly we have a global collapse. If it’s shuffled around into super SIVs or bad banks or whatever it just puts off the problem a short while. No matter how it is handled, this is the 100lb gorilla in the room. 2) There will be a continued downward pressure on wages. We have a global economy, which means there are billions of potential workers. There simply isn’t enough useful work for all these people to do. This is classic supply and demand. Too many workers (supply) and not enough jobs (demand) means low wages (price). 3) Rising energy prices will also act as a drag. If economic activity were to pick up, energy prices would go through the roof. Unless we get a large amount of cheap alternative energy, this will come into play eventually. 4) With big bureaucratic governments trying to fix this within their crony capitalism constraints, things can only get worse. Ed, you have been well indoctrinated into your role as a salesman. Thanks to jesse for pointing out the flaw in the above graph. I can’t believe I read that, my jaw dropped as I read it over a second time to double check. I’m seriously going to stop coming here if this is the stance of the author. Government is making this worse because they are increasing deficit spending, bailouts, etc. The best thing they can do is cut spending, reduce the size of governments, and not get involved. Let the companies go bankrupt and get sold off. Read http://mises.org to get the real fix for economy. Nice post. I would suggest that you follow-up on types of securities people should look at to give some substance to buy low, sell high lest people use this opportunity to buy the wrong things. Thanks. So if history were to repeat itself, the wise ones will be waiting for the turmoil to cease before leaping into the market. Those who invested as Ed suggests would have seen a 50% to 80% erosion of their January 1930 investment before the 50% to 70% recovery of 1932-33. And of course, 1937 more than wiped out 1936 gains. There are bargains out there if you choose carefully. However, the general market for the next year seems a place to tread carefully. there are a few mistakes in your example. second, taxes are capital gain taxes or dividend taxes, which are taxed far more favourably than income. so it’s not 40% taxes, it;s 20% max, more likely less. What do you do after all the debt has been paid off? At some point you have to start saving money. I think the issue here is what is the best vehicle for those savings and presumed retirement funds? Surely if you did the same calculation with a 3-5% yielding fixed income instrument, it would not beat equity returns. I’ve assumed that the rate we have declined has outpaced the 1929 crash, which as you point out, was really a 1929 to 1931 decline. From peak to eventual trough (3 years later), the market wasn’t really down much more than we are today. I guess not only are we waiting for a bottom, but the recovery will be different as well. If I’m not mistaken, it was WWII that got everything chugging again. What is it going to take to launch the economy off these lows? Also, regardless of whether the facts were correct or not, taking dividends in to account for stock market return among investors who are using dividends to pay down debt (i.e. Smith Manouevre) is hardly comforting. In your analyze of a market return by 1942 including dividends of 1929 levels, an investor would be required to pay the interest on the loan by themselves for 13 years! Taking this in to account it may very well take 26 years to return one’s net worth to 1929 levels. And regardless of whether dividends were invested or not, 13 years is still a long time to wait for a recovery. My personal opinion is to follow Mr. Buffet’s advice of when to be greedy and when to be fearful. Right now it seems there is greed circulating among many investors trying to get in at the right time. How else could the market increase nearly 20% since Nov. 20th given the economic data we have been given. Unfortunately the data does not support this greed and I am going to continue to be fearful for a few more months. I just have a question regarding the statement, “don’t turn paper losses into actual losses.” I hear this a lot. But I question it. Doesn’t it depend on your personal situation? Let’s say your RSPS have lost 50% or more of their worth. It could take eons just to break even or have a return that just matches inflation, let alone see any kind of profit. In certain circumstances, doesn’t it make sense to pull your money if you find a better investment opportunity elsewhere? And furthermore, what about those folks who have been planning to live of their RSPS or other investments in the near future? What if they are retiring this year or in the next couple of years? Is there a choice but to realize this loss? If your rrsp’s have lost 50% of their value, it probably won’t take eons for them to recover. What makes you so certain that you’ll be able to find a ‘better investment opportunity’? Most people who do this are just chasing whatever is hot, and end up with a lot less (on average) than those who stick the course. For those who are retiring this year or next, they are pretty unlucky. Best thing for them would be to stay invested and avoid withdrawing any money for as long as possible. Very interesting arguments, although in post #4 you suggest that house values never decline.What you see as “guaranteed investments” into your home wouldn’t be all that useful to people in Vancouver, Calgary, or any other major center where house prices have fallen by >10% over the last year. In February 1989 Toronto house prices peaked. They didn’t recover for 12 years. Stocks go up, stocks go down. Houses do the same, and pretending it “just aint so” gets you nowhere. You are correct. Hopefully this time it will be something less destructive. Currently the markets are down about 30% from their highs. This is considerably less that Ed’s catalogue suggests. Bank of Canada Governor suggests no recovery until 2010, and his is the most optimistic I’ve heard. Wait & see or cautious investing strikes me as the current watchword. the chart in the link you posted (i don’t think its yours) is disengenious. the time scale on the bottom has been hacked so it looks like the blip in the late 80’s was part of a longer term trend in rising house prices. if one looked at it on a constant time scale, it would be obvious that the past 5 years are the blip. i would say housing prices have dropped over 25% from peak already, here in edmonton. Ask yourself…who has paid off all their debt?? Not me. Have you? Seems to me it would be a good thing to pay off a mortgage and pay cash for your next car. The people to blame are the ones that fall for sales pitches like “be in for the long run”…”don’t turn paper losses into actual losses”… “diversify”…equities outperform in the long run” Just ain’t so. Wouldn’t you rather put your money into guaranteed investments (GICs for example) that return a few points as oppossed to taking risk to lose 20,30 or 40% to get the same 2 points??? I’m not making the numbers up. Thank you for presenting data in a clear and organized fashion. I appreciate the time you have contributed to the community. However, the data you present is clearly incomplete and misleading. I’m an avid fan of your blog FT, but this presentation format and its attached conclusions are poor journalism at the very least. @FT you have an engineering degree, many others on these boards have some very number-heavy degrees. I kindly request that you voice any concerns you have with the validity of the above arguments. @Ed, if you are willing to provide the source data used in your above analysis, I would be happy to apply my above arguments to data provided. Briefly though, the graph as presented seems like a normal distribution, slightly skewed to the right with a center between 0 & 10. Let us assume an average inflation of 3.3% and assume that the distribution of numbers is even across each 10% “bucket” in the graph provided. This would mean that 1/3 of each column would move one column to the left. A little visual juggling and it’s pretty clear that graph starts to look a lot more like an un-skewed normal distribution. The “break-even number” for any entry left of zero is larger than that on the right. If I lose 20%, I need make back 25% the following year just to break even. If I lose 50%, I need to make back 100% the following year just to break even. For small numbers, this isn’t always a big deal, but as you pull away from the center this effect gets bigger and bigger. Notice how one block falls in the -40 to -50% bucket, but no block falls in the “corresponding” +67 to +100% block. One year at -50 is worth one year of +50 and another year of +33. Again, single blocks on the left can “cancel out” multiple blocks on the right. If you normalize this, everything on the left simply gets bigger. Well, there’s a lot here, but I think that you likely have to chop out a pretty significant cross-section of this data. Data from 1835 simply isn’t comparable b/c “the markets” from that period are not “the markets” of today. The availability wasn’t there, most people had no access to “the markets”. Tax regulations were completely different, no 401(k)s.
Oversight regulations were completely different. Comparing the markets of 1850 to the markets of 2005 and providing them equal weight is pretty sketchy use of data. Please re-read post number 4: “and $15,000 against your mortgage is about an 8% guaranteed return” does not state that house prices remain stable, or move in any particular direction; it speaks to the investment in (paying off) your mortgage. If you really wanted to, you could hold a mortgage forever, and just pay the interest costs forever. However, every dollar you reduce your mortgage has the benefit that you no longer need to pay the interest on that dollar, and can do something else with it. If Amanda reduces her mortgage by $15,000 she saves $850 after taxes every year thereafter. The question always is: could you find an investment that will return better than this, and particularly in today’s market? I understand the skepticism, for sure there were many years where I wasn’t earning anything on my investments due to high MER’s and poor tax planning. But the reality is, I do know many people that have their debt paid off, I’m on my way and by the time I do get it done, my tax-free and tax-friendly investments will almost certainly beat the returns from GICs. Cash damming and SM make it much easier to beat the interest paid on a mortgage. In your calculation, taxes and inflation apply evenly (actually equity returns are taxed more favorably than interest income) to all investments. So the bottom line is if equities can outperform GICs by 0.2-2.5% (depending on the fees you pay), equities should do better. I know I manage to keep my fees to under 0.5%. I hope so also. I’m betting on the Chinese and Indian consumer. If the American consumer is/was responsible for the majority of growth this past century, then surely when 10X as many people start getting rich, they can spend their way into economic prosperity. Very interesting discussion everyone – quite enjoying this one. Yes, 25 years to return to the same dollar amount, but you are still short, as you had 25 years of inflation amounting to about 50%, so really you didn’t break even until about 1965 if you account for inflation. Since that time the highs of the mid 1960’s saw no recovery until mid 80’s, another 20 year period of variable return. From the early eighties we have seen considerable increases until 2000, when volatility returned. Now had you invested during the lows……. Which seems why dollar cost averaging is so often promoted. The 25 year period excludes dividends, as does the period often mentioned from 1965-82 when the market indexes were the same. Dividends were 5-7%/year average before 1950 and were about 4-5% from 1965-82. I have not seen the inflation adjusted figure, but the 1930s had mostly deflation (negative inflation). In the 1930s, the government did not really know how to manage an economy (perhaps they still don’t) and they made things much worse by drastically cutting back spending and increasing taxes. The stimilous package may or may not work, but a huge tax increase now would certainly make things worse. I understand your comments about government spending not being effective and may even make the problem worse down the road because of the higher debt. My view is that the stimulous package by itself will have virtually no effect. From what I’ve read, only about 20% of it is even targeted at stimulous – the other 80% is all the pork spending and long term projects the Democrats have wanted to do for the last decade. However, economists tell us each dollar is spent on average 6 times each year. So, what can happen is that the government spends a bunch of money which is probably essentially all wasted with little effect. Then after that, the money is spent 5 more times intelligently. For example, the government gives a bunch of money to a buddy to do a useless research project. Let’s say the buddy does no research and just spends it. Wherever he spends it, the money will go to a company that will pay their employees, who will buy groceries and so on, with the money spent another 5 times intelligently. If someone puts the money in the bank, it is then lent out to someone else as well. This is why spending sometimes works. The spending itself is a complete waste of money, but it is then spent smartly another 5 times. This may not apply that much now, since I believe much of the money is on long term projects and may not even be spent this year, but this is the theory behind stimulous packages. Your points are well made. This chart is meant to put 2008 into perspective and show how the markets work long term. The chart was supplied to me, so I don’t have all the underlying data, but the conclusions are still valid, however. Inflation would shift the chart a bit to the left and make it look more like a normal distribution. It would also tend to narrow the chart, since the largest losses (other than 2008) were generally during periods of significant deflation. This would still clearly show the markets are up most of the time. You need a larger gain to make up a loss, such as a 33% gain to make up for a 25% loss, but even with this assumption, there are 25 gains over 30% and only 9 losses over 20%. So, there are still a lot more large gains than large losses. And the largest gains tend to happen not long after the largest losses. The markets are much different than in the 1800s, but the main diference seems to be that it is more manic now. The long term trends, average returns, frequency of bear markets, etc. are essentially the same, though. This is because the long term results are based on the growth of the companies on the stock market. There are a lot more factors that move markets short term now, but the long term picture has not changed much. DAvid: “Now had you invested during the lows……. I think this is the bottom line. If you invest in markets during no growth or high growth times of the market, you’d better keep doing it now. In this market, if you had $15000, and carefully entered on dips, you’d likely be up 15-20%. Look how much the fertilizer stocks are up from their lows, some almost 100%. Be watchful of Mutual Fund Advisors (who are really just salespeople) and how they will prey upon the ignorance that they instill in you: “Be mindful of who’s “interest” is at stake with their “interest”……………..
“Young man, you’ll never get ahead paying finance charges!”, or in this case, MER’s, TER’s and the like. “The only way to make money in the market, is to give advice on how to make money in the market”. Yes, good discussion. You missed my point entirely. You are treating investments and paying off debt as two separate things. I get the SM, debt is good. Don’t be afraid of debt. I read the book a few times. Ask yourself, though, which companies are holding up best in these times?? Ones with good balance sheets. Low debt. Same for us, low or no debt provides a point of flexibility and strength. You don’t need good stock market years and favourable market timing to provide your returns. Cash Dams and SM do not make much money longer term. The only advantage is the ability to write off interest. Is it really worth the risk? If I’m selling MFs, yes absolutely! I certainly don’t view paying down debt and investments as distinct entities. I just don’t view the ‘pay down debt above all else’ strategy as the best one. Your argument seems to be that markets (inflation adjusted, are flat over 30yrs). This doesn’t take into account dividends, which in my portfolio are have yielded 2-5% (after tax, that’s still 1.7-4.25%). The payouts have kept up with and often exceeded inflation. This assumes 0% capital appreciation. Obviously markets have taken a beating, but I simply don’t believe this will go on forever. If you look any of the previous market crashes, markets do eventually recover. So, given our current low interest rate environment, assuming a mortgage between 2.5-5% (but after tax deductions, about 40% lower = 1-3%) – then yes, certainly I’d take those odds. I doubt it’s going to ever get better. Lastly, GICs and all other fixed income investments simply don’t beat inflation over the long run – how could any interest linked asset? Our family’s plan is set for the long run – hopefully another 60yrs. So given that time frame, I’d bet you’d be hard pressed to pick any day in the stock market and show that I could not achieve better than 6-7% returns (dividends are already yielding half that amount). I’m not trying to slam debt repayment, I personally top up my monthly mortgage payments by some 15% in addition to very good lump size annual payments – but after or during a market crash is never a good time to stop investing. I do FULLY agree that mutual funds are never a good idea. I would recommend starting a DRIP if you’re thinking about stocks. It’s what I started this year. DRIPs will open up a whole new world you for, if you do not already know. I would also like to post that given our market lows, 2009 is a great year to buy stocks. What a great opportunity for all of us to buy some shares in a few good Canadian dividend payers and start or continue your DRIP!!!! well it’s all good and fine to dissect the stock market, but… that’s not where most people get their income. Some do, on wall street, but for the rest of us, it’s from jobs. Until hiring picks back up, all the blather about the stock market is jsut that: blather. Your advice is devoid of reason (“ignore the news”!) and your chart is a self-serving manipulation of statistics. If only there were true certification for “certified financial planners”, then we’d see a lot less of this kind of crap trying to lead the sheep astray. Has anyone checked the markets in the last few days of trading? I think Mr. Hoye was on to something and I am glad I continue to be fearful. I think over the next couple of weeks we are going to see lows that make November 20/21, 2008 look appealing. Hopefully you have enough cash on hand to take advantage! When we do long term projections of the Smith Manoeuvre, typically the benefit is approximately 25% from the tax refunds. Most of the long term projected benefit comes from the compound growth of the investments. The Cash Dam is only a tax strategy, with no investments involved. So, it obviously makes money 100% of the time, just like the claiming of any other tax deduction. You are right though that the projected benefit of the Cash Dam is relatively small compared to the Smith Manoeuvre. Good comments. Most investment decisions seem very complicated when you look short term. However, your long term view makes the decisions obvious. There are periods of time when the markets are down or have low returns, but long term the returns are very good. The reasons for it are that, underneath all the short term sentiment, there are big, solid companies that can always adjust their operations to make profits. As long as companies can continue to produce rising profits over time, the markets eventually go up. One more point in your debate with Paul. Short term, you can compare the returns of debt repayment vs. investing in the stock market. However, when you look at your financial plan and what you need in your life, there is a big difference. The difference is that you cannot finance your retirement purely on debt repayment. Once your debt is at zero, then what? Eventually, most people will need a significant nest egg to finance their retirement. Managing debt effectively is part of a financial plan, but no financial plan is complete without a sound investment strategy. equities comes up better even after losing 32.9% in the last year..
is asset allocation with periodic rebalancing required? it does’nt seem to do any good. The main purpose of asset allocation is reducing risk, not increasing return. If your purpose is to have the highest long term return, you should stick with 100% equities. However, your figures show that rebalancing can work. If you had just invested with a 50%equity/50% bond allocation, you would end up with $143,917. With rebalancing, you ended up at $148,798. Rebalancing, in your example, would reduce the equity allocation after 6 years of superior equity returns, so that there would be less equity before the big down year. Not surprisingly, however, the 100% equity portfolio had a higher return. It also meant higher volatility. In the last 30 years, bonds have had 1/3 of the return of stocks, despite interest rates declining from historic highs to historic lows. Declining rates produce higher returns for bonds, so this period was ideal for bonds, yet stock returns were still 3 times higher. Asset allocation will reduce your long term return, but also reduce your risk. The right answer, therefore depends on your long term goals and risk tolerance. Rebalancing mostly reduces risk, but also tends to produce higher returns than buy-and-hold of your original allocation. Jim Rogers has been bullish on nearly all commodities for years. Commodities always require proper timing, since they don’t normally rise over time. There might be cases in the future when they do because of a genuine, permanent shortage, but any bull markets tend to be short-lived. Given that there are thousands of companies at irrationally low prices these days, why invest in something that is not really cheap at all? It may seem scary to invest in the stock market today, but that is where the great deals are. @Ed, just going through the archives and looks like you made the right call here as well! Hey FT. Thanks again for noticing. I don’t profess to have any great insight. Buying in after a large decline is the one, easy market timing strategy that works. Other than the 1930’s, every annual decline of the S&P500 of more than 20% was immediately followed by a gain of more than 20%. All that was required to see early 2009 as a wonderful buying opportunity is faith in the stock market long term. I just read an article that people are more scared of investing in the stock market than they are of speaking in public or even dying. I think this is a gross misunderstanding of stock markets. Stock markets have consistently recovered from all declines because they are a bunch a huge companies that have all kinds of methods to get their profits up – cutting costs, new products, sales promotions, buying another company, selling unprofitable divisions, restructuring debt, etc. As long as they can eventually get their profits back up, the stock market will also eventually recover. Early 2009 may be the best buying opportunity of our lifetime. I think it was quite obvious for people with faith in the market long term, though.